I’m a Loyal Scot…..So Now What? Show your pride by wearing the CMU logo, liking CMU on Facebook, etc. Once you’ve done all this, you’re a Loyal Scot. And what does that get you? ….and a vaguely accusatory letter implying you’re a zombie, communist, or Justin Bieber Fan. That’s it. The problem with this is it’s entirely unclear what this gets you or what you’re supposed to do with it. Imagine a rewards program for a credit card where you get “Ultra Gold Platinum Level” after spending $20,000. Then they send you a letter and a pin. And you’re wondering what you get besides bragging rights. Now, I support CMU. I went there twice (Chemical Engineering ’93, MBA ’03). My wife went there (Biology women at CMU are awesome). My nephew went there (another ChemE stud). A friend from high school went there. Most of my “adult” friends are people I met at Carnegie Mellon. My wife worked there, and several current friends work there. I’m always up for a CMU/MIT throw down over who’s geekier. I’ve volunteered for CMAC (Carnegie Mellon Alumni Council) where I’ve interviewed prospective students. (I’ve actually gotten upset when they haven’t admitted someone I thought would be great.) I’ve helped with move in, and I’ve volunteered for Management Game as a board member several times. And I’ve obviously tossed them some George Washingtons since I’m a Loyal Scot. Beyond a pin and the right to truthfully state I’m a Loyal Scot, there’s nothing. And anyone could say he/she is one. If challenged with the lack of a name on the CMU website for it, one could just state one took advantage of the offer to withhold a name from the list. Now, I understand CMU wants to encourage more alumni participation. Andy’s place has only been around for a short time relative to more well known places like MIT, Harvard, Stanford, etc. The alumni base (and endowment that partially results from the base) is consequently much smaller. But the Loyal Scot program doesn’t really do anything. 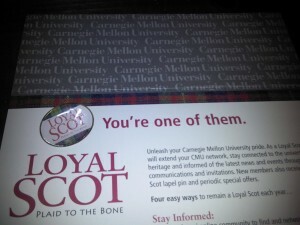 I can shout “I’m a Loyal Scot” and another alumnus/a could say, “Well, I bleed plaid.” Another could say, “I’m a tilted square, dudes!” We’d all sound the same. What CMU needs to do is add something that people like and will work for. I’m talking swag and bragging rights….real bragging rights. How can CMU do this? My wife had the genesis of a great idea: Like a rewards program, let alumni earn points. Alumni can then cash in those points for cool stuff and the chance to brag with it. For each of these, you get some points. Say 10 points for each non-monetary action. For the money, you get a point per dollar. Now, for everything extra you do, you get more points. Interview a student? 10 points. That student is admitted and matriculates? 50 points, dude! Volunteer for an event? 10, 20, or 50 points, depending on the event and what you do. Slide some more cash? A point per dollar. Maybe during a fundraising event, they give bonus points. Contribute $100, get 300 points. Get a fellow alumnus/a to sign up and become a first time Loyal Scot with you as the “recruiter”, and they slip you 100 points. But it doesn’t stop there. Put up a website with a leader board. People who place first for points earned during a period can get bonus points. Top point earner for the LA chapter during the first quarter of 2013? Here’s an extra 100 points. Have competitions among the chapters. If your chapter earns the most collective points for a year, everyone who earned a minimum value (say 100 points) gets an extra 10%. And use all that social media stuff. Top earner for a month? Tweets and Facebook posts from CMU pointing out how awesome and cool you are. Plus, you can roll out the misty eyed nostalgia stuff. I’d kill for a tilted square t-shirt or sweatshirt. So there you have it. A rewards program that encourages alumni to get involved, spread the word, and throw some cash CMU’s way. The points and rewards could all be tweaked, but at the very least, it should be structured so that the minimum gets you a shirt every year….and when alumni see all the extra cool stuff they can get, they’ll be encouraged to earn and save points for exclusive CMU swag…. ….because even though I hate bobbleheads, a bobblehead Andy Carnegie available only to Loyal Scots would totally rock on my car’s dashboard. Edit (2/10/13): You know what this program also needs? A system where Loyal Scots can award points to other Loyal Scots. Say CMU wants to have a contest called “Show Us Your Plaid” where CMU alumni show themselves with CMU stuff all over the world. (If you’re a member of Steeler Nation, this is like those great fans that show themselves with Terrible Towels in front of famous places/monuments/etc.) Each current member of the Loyal Scots gets something like 10 points to assign. They can assign them all to one person or spread them amongst people. 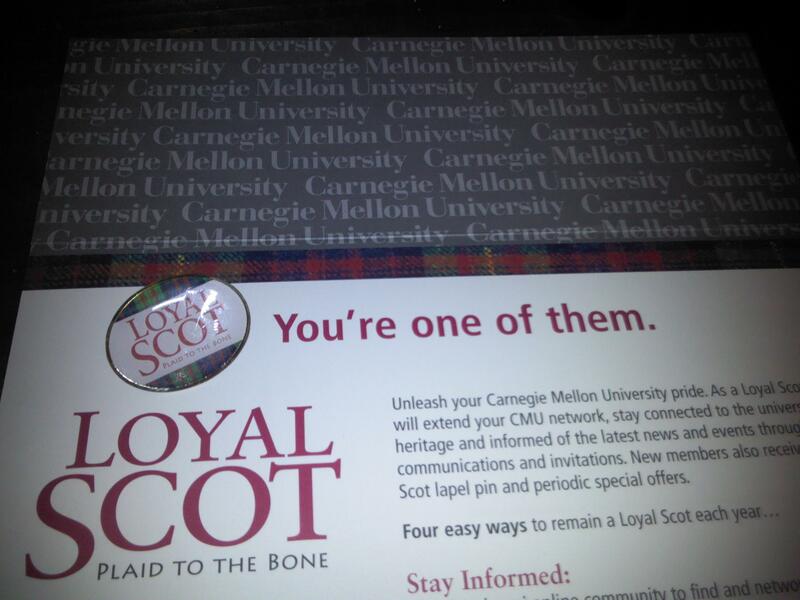 Set up a website where people post pictures of themselves with CMU stuff and Loyal Scots award the points. Think of all the cool things that would happen. It’d be awesome to see some alumnus/a with CMU shirt in front Skibo Castle. I’d definitely award some points to that person! You just know that some devoted alumnus/a would be angling to get a picture with the President with Scotty. Previous Previous post: You will be DELETED!